The Northern Lakes Economic Alliance is deeply committed to our region and the creation of new economic and employment opportunities, expansion of existing industry, attraction of out-of-area businesses, and strategies that promote a positive business climate not only in Northern Michigan, but throughout our state as a whole. We welcome the opportunity to help you learn more about our efforts. 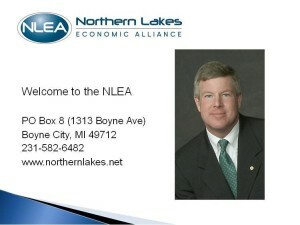 To arrange for a presentation by an NLEA staff member, simply contact us by email, or phone at 231-582-6482. Click on the images below for a brief slideshow of the NLEA Orientation Presentation. If you would like a guided tour of the NLEA, click on the image below to go on a 15-minute walkthrough with our President, Andy Hayes.